After Snofru two even larger pyramids were to come and another 14 million tons of stone were to be piled up on the desert plateau. One cannot help feeling that the Egyptians gloried as much in this stupendous achievement, towering over their living world, as over having sent off their pharaohs to accompany the sun. Pyramid building was now getting on for a century; for three or four generations of Egyptians it had become their normal life. By then, we may assume, the social object of the gigantic technological project had been attained. The country had now lived for so long in its new social and political environment that the old 140 tribal existence was largely forgotten. It was time to give up what had become an unnecessary and wasteful occupation, and it is remarkable that the running down of the pyramid project should have been achieved with what appears a minimum of trouble. As happens with any large and heavily entrenched programme, the pyramid age may have gone on for a bit too long. The administration had evidently manoeuvred itself into a vortex of pyramid construction from which it was difficult to escape. A large section of the civil service, reaching down into low levels of administration and comprising several thousand officials, derived and justified its livelihood from pyramid building. It represented a large vested interest. Keeping this in mind, certain upheavals in the dynastic orbit which we have already touched upon and which have usually been explained as a palace revolt, acquire a more profound aspect. There was obviously some trouble at Khufu’s death. The legitimate heir, Kawab, was dead and the succession should have passed to one of his full brothers, all sons of Khufu and Queen Mery tyetes, who alone carried the royal blood. Instead, the throne was usurped by Djedefre, who then married the great queen of the next generation, Hetepheres n, the widow of Kawab. So far it all looks like a harem intrigue, except for one point. Djedefre, although he put the finishing touches to Khufu’s monument, had all further work at Giza stopped. Since we know that at that time Khufu’s pyramid was essentially finished, work must have been well advanced on the next large pyramid, eventually to be used by Khafre. 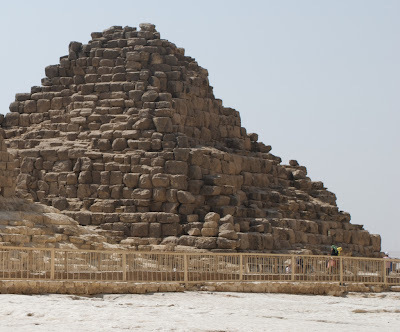 However, Djedefre did not complete this Giza pyramid for himself but selected for his own burial a site at Abu Roash, and it is significant that the pyramid which he planned there for his own use was almost ten times smaller than that of Khufu. Far from being the seizure of power by the son of a concubine, it very much looks as if Djedefre’s succession to Khufu was based on a movement to break away from the pyramid building establishment of Heliopolis. He occupied the throne for only seven years and we do not know how he died. During Djedefre’s reign a gradually decreasing labour force was probably employed on the construction of the immense causeway at Abu Roash. Such a reduced force would have been quite capable of building the small projected pyramid as well at the same time with no undue difficulty. With Khafre’s accession, work at Giza was resumed but it is obvious that it never regained its original strength or impetus. Khafre’s own pyramid, which, when he became pharaoh, was probably in the last phase of construction, was completed, though R.p—8 141 not with the same care as that of Khufu. In fact, it is even doubtful whether after Djedefre’s death the number of men employed again at Giza were brought up to anything like the original strength. It would be more rational to assume that the labour force was not appreciably increased again and it was evidently run down to a low strength for building the last Fourth Dynasty pyramid, that of Menkaure. For the next monument, Shepseskaf’s Mastabat Fara’un, a quite modest number of workmen will have sufficed. One certainly would not wish to claim that our analysis of the end of the Pyramid Age will be correct in detail. However, these last conclusions were arrived at by correlating the technological evidence with the known succession of kings at the end of the Fourth Dynasty and, on the whole, they seem to make sense. It is also interesting to compare these deductions with the legends concerning the pyramid builders that were handed down through Egyptian history. While Snofru was always remembered as a beneficent pharaoh, the same cannot be said of Khufu and Khafre. Herodotus records a story that Khufu and Khafre were hard and wicked kings who suppressed the people and closed the temples, and that it was Menkaure who opened them again and was beloved. Popular legends, while they can hardly be regarded as established historical accounts, often contain a grain of truth. In the present case they fit rather too well to be discounted. It is not unlikely that the vested interest of the administration tended to prolong the pyramid project beyond the stage when its usefulness had been exhausted. Moreover, bringing the villagers together to a common, and remunerative, task will at first have brought about friendly relations between strange tribesmen. On the other hand, this fusion must eventually have had the effect of turning them into an organised force which was capable of discovering common interests other than those in the mind of the establishment. In other words, once a homogeneous nation had been created, it was likely that paternalism gave way to a trade union spirit. The newly established state of the Egyptian people may have taken on a life of its own. The core and driving force in the administration was the Heliopolitan priesthood of Re who had initiated and sustained the pyramid project. Starting with Imhotep’s escalation of the labour force, the programme had proved eminently successful. The enterprise had spawned an immense and well-organised civil service which permeated and regulated all aspects of life. Its close connection with the pharaoh was ensured by the fact that the vizier and the highest officials were royal princes. Thereby the administration was fully integrated with the religious leadership of the nation and opportunity was provided for consultation on all important decisions. The pharaoh himself had become the spiritual figurehead of a large and highly efficient administrative machine whose directives came from the priesthood of Re, who were the real government of Old Kingdom Egypt. However, there was still the priesthood of Ptah with its hold on the scribes and learned men, and, as evidently happened at the end of Menkaure’s reign, the pharaoh, in this case Shepseskaf, may have felt assured of popular support against the pyramid diehards of Heliopolis. He evidently brought it off, at least for the time being. There is an echo of priestly schism in the legend that Khufu and Khafre closed the temples. Possibly these were the temples of Ptah. One thing is quite certain, Shepseskaf’s refusal to build a pyramid brought the Heliopolitan priesthood to their senses. They eschewed further construction of gigantic pyramids and settled for a new and relatively inexpensive solar emblem, the obelisk. A period of greater influence of the Ptah priests may have temporarily intervened during Shepseskaf’s reign but again the reorientation towards the solar cult of the Fifth Dynasty appears to have taken place without spectacular disorders. A similar mastaba to Shepseskaf’s was constructed for Queen Khentkaues, the carrier of the royal inheritance. However, whereas Shepseskaf forsook the Giza necropolis for Saqqara, his sister Khentkaues returned to Giza with a tomb built between the causeways of the Khafre and Menkaure pyramids. In one way or another, probably by marriage to the high priest of Heliopolis, Userkaf, she became the founder of the Fifth Dynasty. It is interesting to note that Userkaf was probably not a usurper but may have had his own share of the royal blood. However, it seems that he inherited it, not through the branch of the royal family represented by Khafre, Menkaure and Shepseskaf, but from his mother Neferhetepes who was the daughter of the much married great Queen Hetepheres II by the renegade Djedefre. We cannot leave the Pyramid Age with its stupendous achievements in both buildings and social change without having a look at its life and people. As for the pyramid builders themselves, a seated statue of Zoser was found in a small chamber attached to the north side of the Step Pyramid. Unfortunately, its face was badly damaged by thieves who broke out the eyes which were probably made of rock crystal. Even so, the features reveal the high cheekbones, characteristic of some of his successors. There exist a number of good profile representations in the reliefs of the underground chambers, which show a man with strong features and an aquiline nose. Until recently we did not know what Snofru looked like, but the post-war excavations at Dahshur have yielded a stela with the king’s portrait. His profile shows a surprisingly weak face with receding chin. Only one likeness of Khufu has been found so far. It is a small ivory figure and, although it is not too well preserved, the king’s features are clear enough to indicate determination, underlined by high cheekbones and tight lips. The same high cheekbones and firm determined mouth characterise the life-size quartzite head of Djedefre in the Louvre Museum. Far better preserved than any of these is the magnificent diorite statue of Khafre from the valley temple of his pyramid. Here the full mastery of the Old Kingdom sculptors is revealed for the first time. The artist has created an intensely human portrait, which at the same time is far removed from the everyday world. Out of his human face the king’s eyes gaze into space and the incomprehensible realm of the divinity. His companions are not the mortals but the sun god who, in the shape of the Horus falcon, spreads his wings protectively around the king’s head. The pharaoh has become the sacred link between man, whose form he bears, and the gods who rule the universe. The same enigmatic detachment is expressed in Khafre’s other surviving portrait: the head of the Sphinx. Havoc, wrought for over 4,000 years by man and the elements, has failed to obliterate the serene majesty of the features which the ancient Egyptian sculptor carved out of the living rock. The mastery in the expression of this face, which seems to look from our world into the next one, has haunted man for hundreds of generations. Khafre’s portraits seem to stand between the ages of divine kingship and of the human beings on the throne who followed him. There is nothing divine or supernatural in the sensual face of Menkaure with its generous lips and slightly bulging eyes. It is again the uncanny skill of the sculptor who, in this representation, was to bring the pharaoh down to earth without sacrificing the family similarity with his father Khafre. This unmistakable likeness is retained in the portrait of Shepseskaf, in which the sensual countenance of Menkaure is almost degraded into vulgarity. Khufu’s great wife, Queen Merytyetes, shows beauty and feminine warmth. The Boston Museum of Fine Arts has a charming double statue of the much-married queen, Hetepheres n, and her equally royal daughter, Meresankh m. The mother’s arm lies protectingly over Meresankh’s shoulder; they were both carriers of the dynastic inheritance and both spouses of Khafre. In Menkaure’s sister-wife, Khameremebti n, her brother’s sensual expression is mildly accentuated through her feminine features. Passing on to the Fifth Dynasty, we search in vain in the face of Userkaf for traces of the uncompromising determination of Khufu and Djedefre, or for Khafre’s divine mission. It is the face of a human executive with all his virtues and failings. We have dealt earlier with the civil service in the pyramid age and we are fortunate that the consummate skill of the Fourth Dynasty sculptors, coupled with the demand for the closest possible likeness, has provided us with numerous portraits of high officials and their wives. Many of these are the strange ‘reserve heads’ found in their tombs. These may have served as substitutes if the mummy was destroyed, but we are in the dark as to their definite purpose. It is astonishing that on many of them the ears seem to have been broken off purposely. In one case they highlight the close connection with Africa, since the facial features of the wife of a high official leave no doubt that she was a Negress. On the whole, these intelligent and determined faces would equally fit any modem meritocracy, and officials often liked to be represented at their work as ‘scribes’. There are also many family groups, among them that of the dwarf Seneb. Dwarfs were much in demand as treasurers since they would be easily recognised and therefore less likely to attempt a quiet getaway with the valuables under their care. Even the earliest examples of portrait sculpture, such r.s that of Prince Rahotep and his wife, who lived at the time of Snofru, show the stamp of a sophisticated and astonishingly ‘modern’ society. He could be an army officer of today and the Lady Nofret would effortlessly pass muster in any elegant set of our own time. We even know what their servants and craftsmen looked like from the effigies which accompanied their masters in the life after death. Finally, Reisner’s discovery of the tomb of Hetepheres has provided us with the furniture of Snofru’s great queen which, in sheer elegance and the restrained use of gold, surpasses anything which the tomb of Tutankhamun discloses. What little has been left of Old Kingdom literature agrees with this picture of a cultured and dignified world. The advice of such men as Ptahotep, Kagemi and others reflects a sober wisdom which would have done credit to the philosophers of any later age. They praise the ideal of the ‘silent man’ who receives the order given by his superior without argument and who carries it out conscientiously and without giving himself airs. He must not boast of his learning but should always be ready to learn himself, if necessary from the poor and humble. He should be kind to petitioners and patiently hear out their case before making a decision. Greed and corruption are described as the worst malady, which is incurable and so contagious that any dealings with it are impossible. These brief glimpses of life in the Pyramid Age have been included to show the social and intellectual background against which we must regard the gigantic technological project. They reflect a sober and essentially practical society whose mind and reactions were eminently sensible and show little sign of devoting much effort to esoteric issues. Building pyramids, as we suggest, for political and economic reasons seems to fit a good deal better into the picture of this level-headed and sophisticated community than devoting prodigious effort in erecting several gigantic tombs to bury one pharaoh. The pyramids do not represent an aim in itself but the means to achieve an aim : the creation of a new form of society. These huge heaps of stone mark the place where man invented the state.